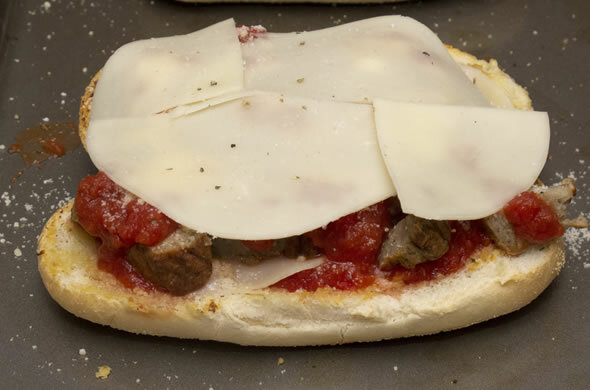 This doesn’t seem like it really warrants a recipe, but this hit the spot and makes all other meatball subs look sad.The key was the garlic bread. It was a pretty good “water-proofer” to keep the roll from getting too soggy too! Bake for 5 minutes at 400-degrees. 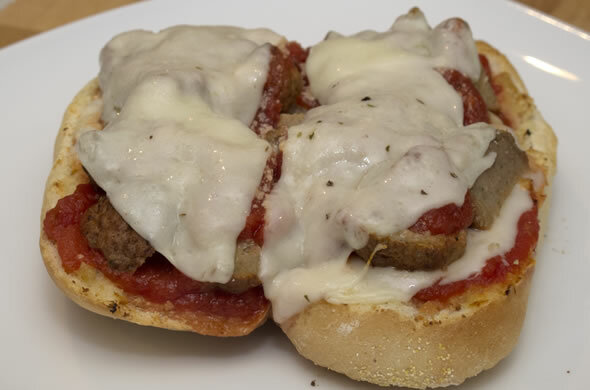 Cut meatballs into quarter chunks and warm with sauce while bread is toasting. Remove the rolls and top each one with 1 slice of provolone. 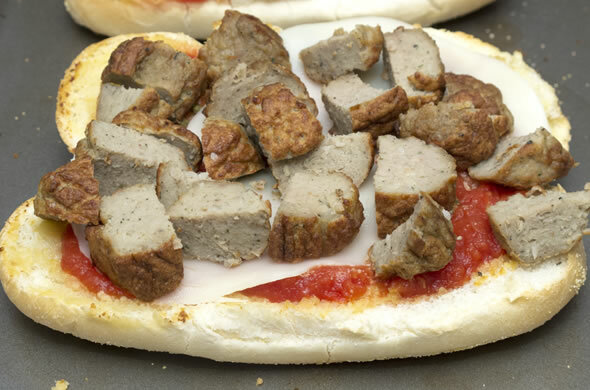 Add sauce, meatball chunks, and more sauce, then top with remaining cheese. Bake 5 minutes at 400-degrees until melted. I loved how garlicky it was and the truffle oil was a great addition. I cut the meatballs to make it more manageable but if they were smaller I might not have. I think the important thing to remember to keep these as a quick kitchen-to-table dinner is that if everything is warm, they don’t need to cook long. The meatballs and sauce were both warm so all that was happening in the oven was the cheese melting. We don’t eat a ton of sandwiches at our house but I’m working on changing that. I know, I know, I’ve said I don’t love sandwiches. I actually love them when they’re made-to-order. I adore breakfast sandwiches too. I only dislike sandwiches that have been sitting around sogging all day inside a high school locker or if I can’t tell what’s inside the sandwich. I had a lengthy discussion at work about hummus on a sandwich…or hummus in general. Did you know the USA has a dried bean and lentil council? This is my worklife. Anywho, back to the sandwich subject at hand. 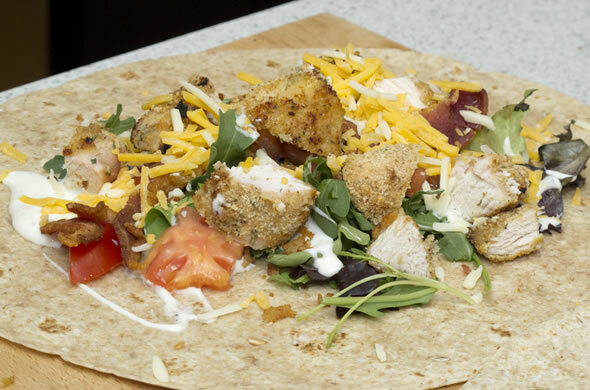 I made Chicken Bacon Ranch Wraps and they were really tasty. 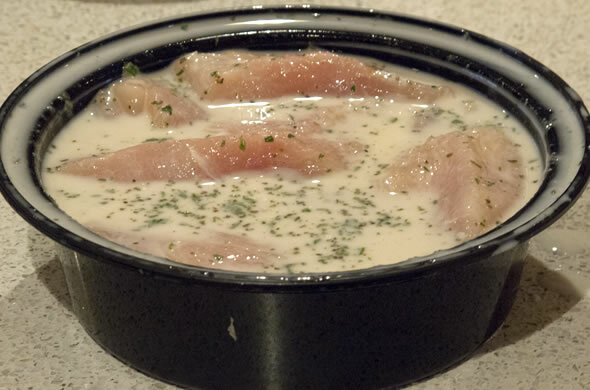 Marinate the chicken in the milk, ¼ cup of the ranch dressing, and dried ranch powder for a few hours. 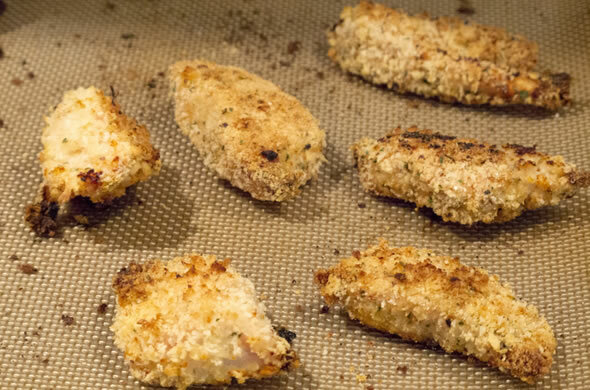 Remove from the marinade and dredge in eggwash then breadcrumbs and bake at 400 degrees for 20 minutes. Cook the bacon, then crumble it. 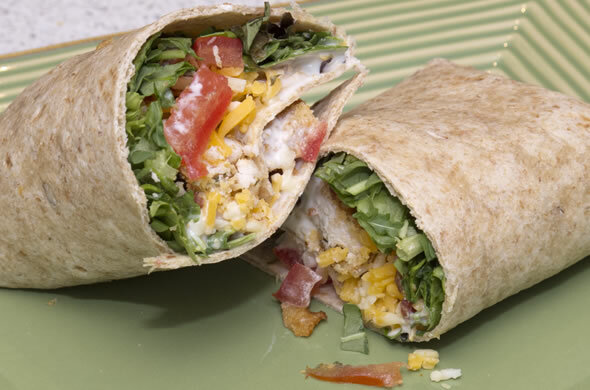 Assemble the wraps with lettuce, tomato, chicken, bacon, cheddar, and ranch. You don’t really need a recipe for this but I thought the marinade and breading was spot-on so I wanted to share it. I liked that these were filling and fresh but not fried. I have an aversion to frying foods. The wheat wrap and real lettuce (iceburg = not real) make this slightly healthier than your local pizza place’s version of the same thing since my chicken isn’t fried either. 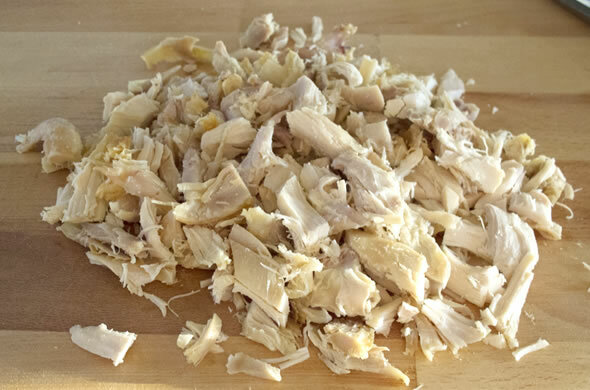 Like most things I cook, the chicken could be prepped in advance and popped in to speed up the dinner, or prepped and frozen for next time. If you’re lucky like me, when your sis comes to have these for dinner she’ll also bring treats from her favorite bakery! On one of those beautiful pre-spring days I wanted to put something together for dinner that was filling but lighter. This hit the spot. These Greek meatball wraps were warm, cool, crispy, meaty, and crunchy. I was really happy with these and will definitely make these again. 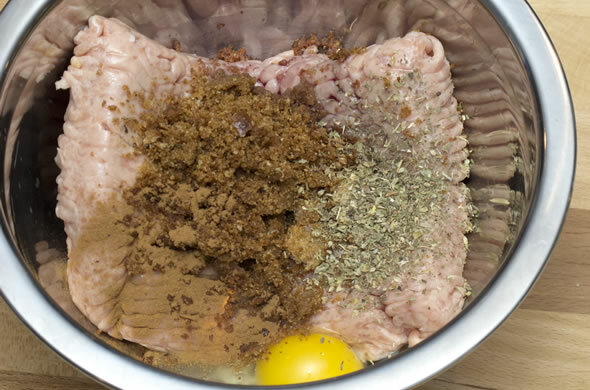 Mix meatball mix together and let sit for 5 minutes before baking. 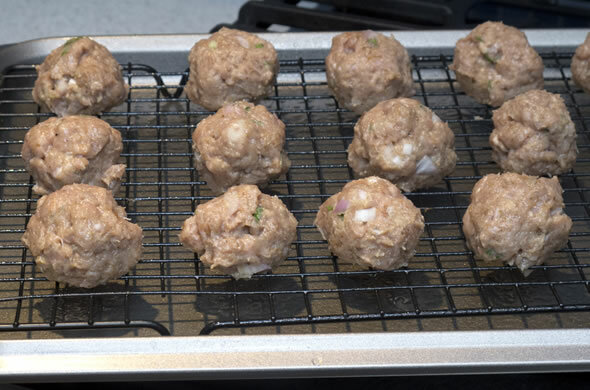 Roll into balls and bake for 30 minutes. I use a cooling rack ontop of a baking sheet. It helps keep the meatballs crispy and not soggy from the grease (there’s not much grease since I used ground chicken rather than beef). I served them on wheat naan wraps with tzatziki, veggies, hummus, and feta. Check out whose nose was a bit too close for comfort! These were really good. The meatballs were crispy on the outside and juicy on the inside. 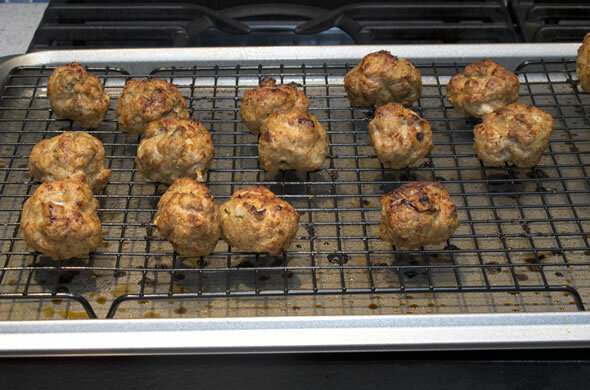 I don’t fry my meatballs since a) I hate frying for the mess & the oil and b) it’s much easier and healthier in the oven. I liked the wraps. The naan was perfect. Since it’s more pricy, leftovers were in wheat pitas. The pitas worked fine. 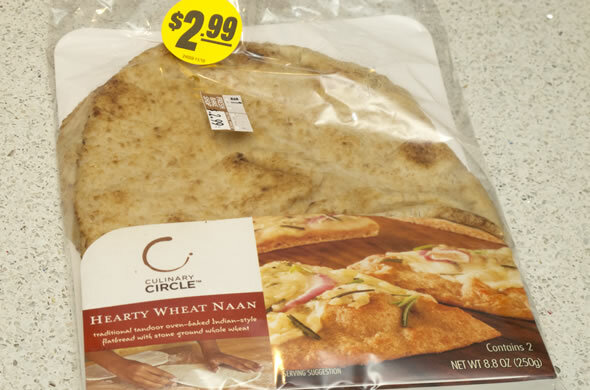 I liked how doughy the naan was. Happy Birthday to Dr. Seuss! 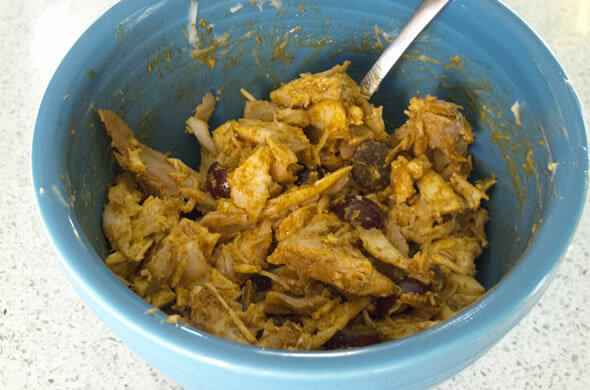 This Curry Chicken Salad was the best I could do to honor the late writer of The Butter Battle Book, the Lorax, and Sneetches as an example of ooblek or wumbus because of the zing, bam, wow, pow this has. I expect my birthday tomorrow to have the same kind of impact! My birthday food theme might be my best yet! I pretty much only like sandwiches when I make one myself and eat it immediately, or if it has all sorts of crazy things on it and it gets pressed, and occasionally when a restaurant makes it. That might sound like all the sandwiches you can think of, BUT I don’t bring them to work as lunch. 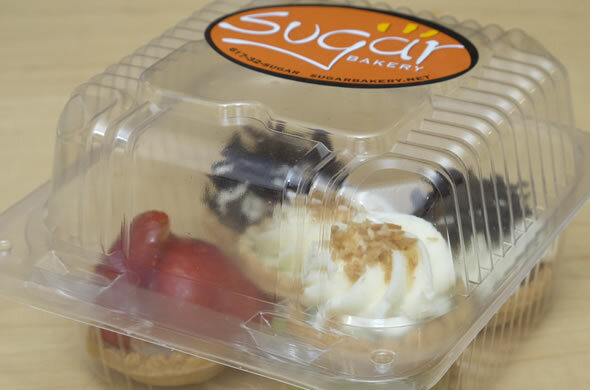 If I’m going to have one, it has to be packed separately and assembled and eaten immediately. 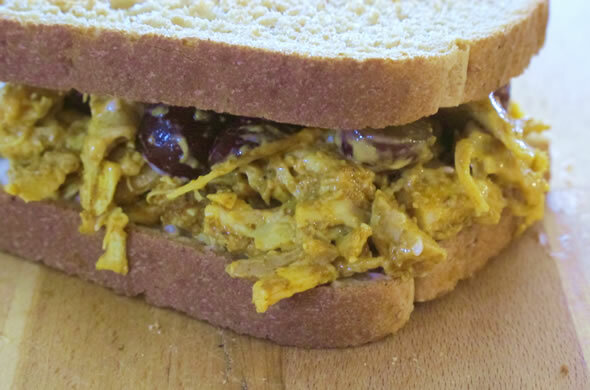 I thought of curry chicken salad because it doesn’t have to be a sandwich and it is different. It was a great use of some leftover rotisserie chicken. 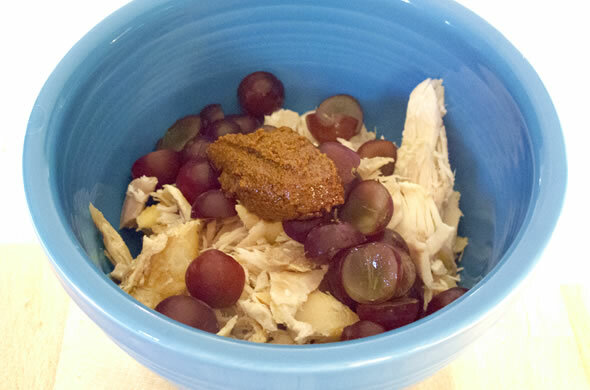 Mix chicken with curry sauce, grapes, and add mayo to taste. This made about 3 size-able servings. I had one as a sandwich and two other servings topped salads. I think the grapes are necessary to cut the spice with some sweetness. The zing makes this great. 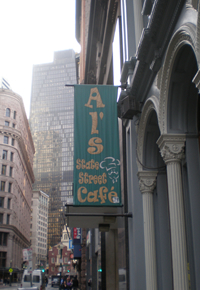 I’m lucky to work in the heart of downtown Boston with more lunch restaurants around than I know what to do with. I rarely take advantage of them. One hot hot hot day my office had plants to rendez-vous with our sister office at the Dewey Square Farmer’s Market for lunch. It was so hot hot hot that I’m surprised I could remember what I ate (or how good it was)! 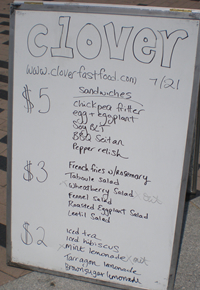 Clover was a welcome relief from the mind-numbing heat. They worked the crowed and kept it moving. I was so impressed with the ordering process via iphone and the options. Check out how many of them there were working inside the truck! Wow! I didn’t check out twitter that morning to see what they were serving but was pleasantly surprised and was too hot to ponder. I quickly chose the chickpea fritter sandwich. 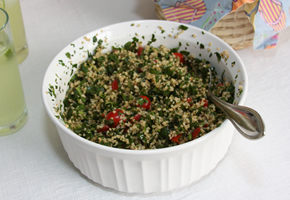 It was really good, though I’m not sure what made it different than falafel. It had great flavor. The chickpea fritters were soft with a light crunch on the outside and a surprisingly fluffy center. 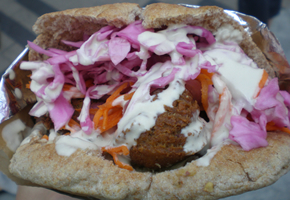 The sandwich was on an oversized pita with carrot and cabbage slaw. Somebody got rosemary fries. 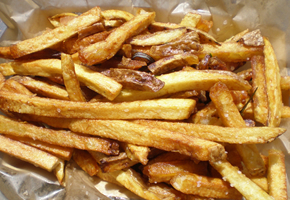 It was such a lovely flavor added to really great quality fries. Their food is so good and I really need to eat at Clover more often. 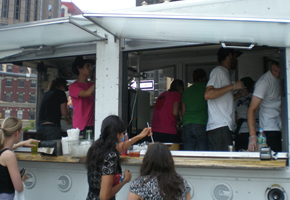 Do you watch Great American Food Truck Race? 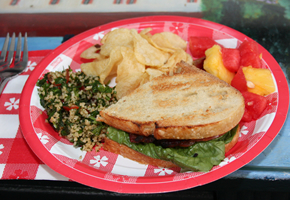 It’s awesome and a truck from Boston, called Roxy’s Grilled Cheese, is on! 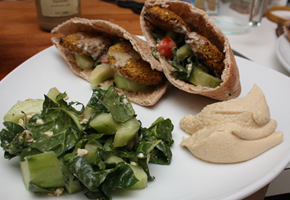 I looove falafel. I think there’s something about the nutty crunch, the cucumbers, tomatoes, and creamy tahini. I hadn’t really even thought about making it myself until a couple of years ago. At that point a few years ago, I soaked the chickpeas overnight, I cooked them for an hour, mashed them, etc… It’s such a process unless you’re mass producing falafel! 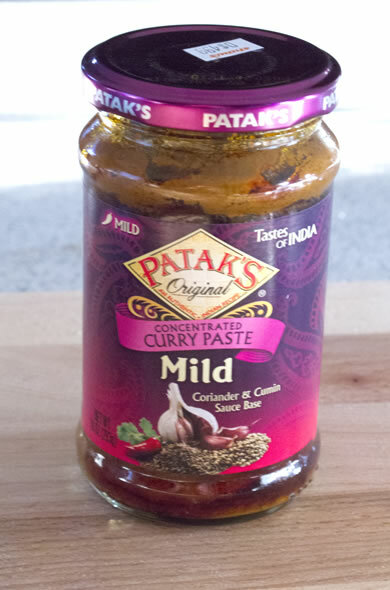 The mix is the way to go…10 minutes and it is ready to cook. 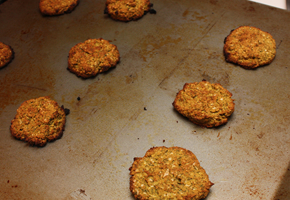 I bake them instead of frying them, partly for ease and partly for health. They get crispy and delicious. Bake at 375 degrees for 10 minutes on each side. 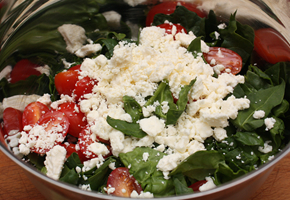 Chop lettuce, tomatoes, cucumbers and toss with feta and dressing. Serve in pita, drizzled with tahini. I’ve made these as appetizers like a slider in halved mini pitas. 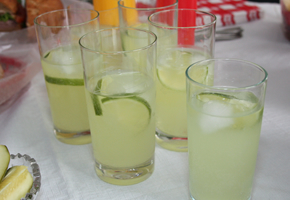 They’re always a hit and super easy to make. I definitely don’t think you need my instructions, BUT I think falafel is something that doesn’t always come to mind to make at home. Mr. J and I had lunch with my parents at their house and were lucky enough to join while they recreated a restaurant favorite. 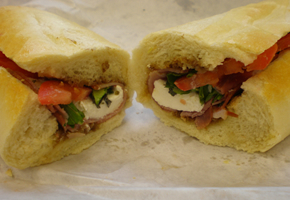 They ride bikes on a trail in Bristol, Rhode Island and pass an unassuming sub shop called Ricotti’s. One sandwich has captivated them. 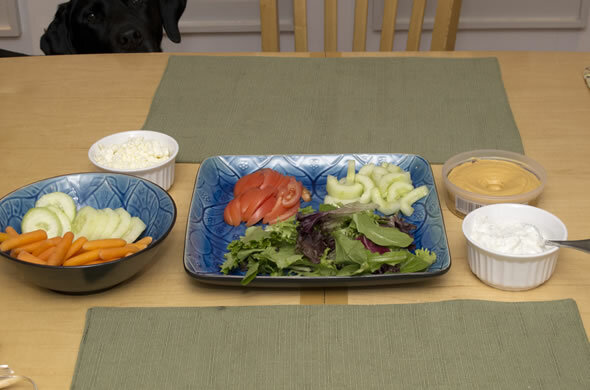 Our lunch was a recreation at home. Turkey, bacon, cranberry, tomatoes, and melty cheese are the highlights in this. Mum made one big sandwich and we all dug in. 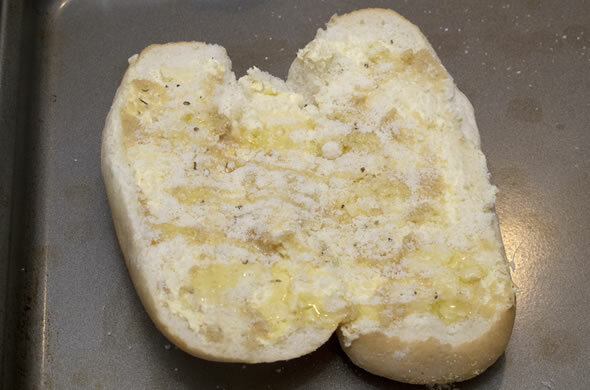 Hollow out the bread by slicing off the top and scooping out some inner bread. 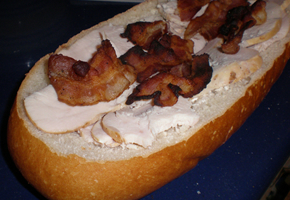 Layer slices of turkey, cheddar, and bacon. Replace the top and bake at 350 degrees for 10 minutes just to melt the cheese and warm everything through. 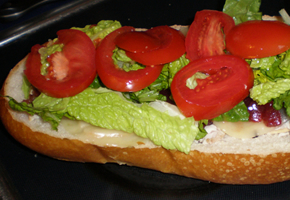 After removing from the heat, layer tomato and lettuce before replacing the bread top. They were right, it was a really good flavor combo. Mum thought baking it mid-way through layering the fillings was key. 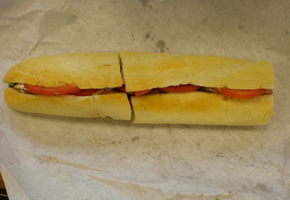 This meant the sandwich was warm and melty but still had the crisp lettuce and juicy tomatoes. I liked the cranberry but since I love tart cranberries so much, I would have liked whole-berry cranberry sauce. Mum and Dad like a marinated turkey breast that they had for dinner and used some leftovers for this lunch! Everyone liked it…definitely a crowd pleaser. It was a fun lunch and Mum even whipped up dessert. Stay tuned for that! Flour Bakery & CafeI’ve enjoyed all different foods at Flour and I will miss working right near the new Central Square location when my office moves. This one bakery/restaurant shines above all the others and I’m so glad they took a chance on Central Square Cambridge. Everything is good. Everything is unique. Everything tastes like they made it just for you. 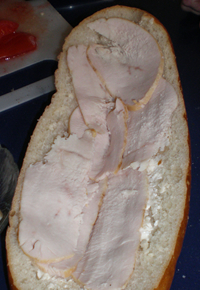 Some of my favorite sandwiches there I COULD make myself, but they do it better. 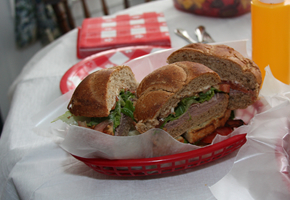 I recently had a great tomato, mozerella, pesto sandwich and one of the homemade oreos. 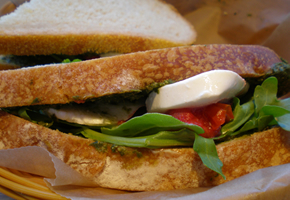 The sandwich is so great because instead of basil leaves, they smear pesto on and you can smell the freshness even before taking a bite. 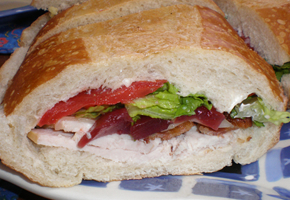 Another fantastic choice is the smoked turkey, vermont cheddar, and cranberry chutney. 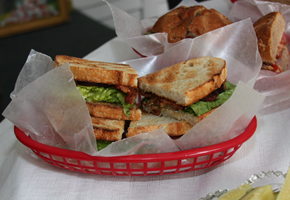 You can get any of the sandwiches pressed which brings out the love in this one. The roasted lamb, goat cheese, and tomato chutney is good, but might have too much goat cheese.Bakery items are to die for…you can’t go wrong! I had the oreo for the first time recently and thought it was great! 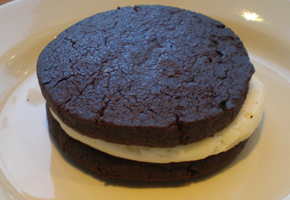 I expected it to be more spongy, like a whoopie pie. It was perfectly crisp and delightful.